This spotlight examines the foreign born from the Caribbean. It is the fifth in a series on the size and characteristics of the foreign-born population in the United States by region of birth. The Caribbean born make up a small proportion of the overall foreign-born population in the United States. However, the number of immigrants born in the Caribbean has grown rapidly over the past 40 years. As a group, the Caribbean born are less likely to be proficient in English or have university degrees compared with the overall foreign-born population. However, they are as likely to participate in the labor force as the overall foreign-born population and are more likely to work in sales and office or service occupations. Closer examination of this population reveals a great deal of variation by country of birth. Thia series draws primarily from Census 2000 data, including social, economic, and housing profiles of the foreign born developed by the U.S. Census Bureau. The Caribbean born accounted for almost 10 percent of the total U.S. foreign-born population in 2000. Cubans made up the largest proportion of the Caribbean born in 2000, followed by those from the Dominican Republic, Jamaica, Haiti, and Trinidad and Tobago. Slightly over half of the Caribbean born were women. The Caribbean-born population in the United States experienced slower growth between 1990 and 2000 than the overall foreign-born population. 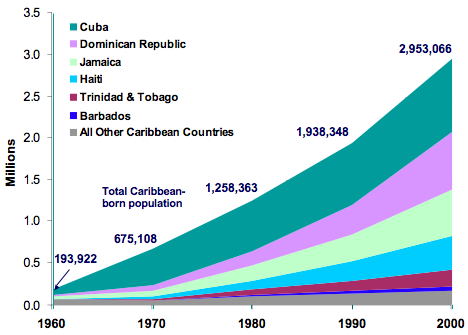 Immigrants born in Cuba, the Dominican Republic, Jamaica, and Haiti accounted for most of the increase in the numbers of the Caribbean born between 1960 and 2000. Note: Some data include the Caribbean n.e.c. (Not elsewhere classified). This includes those reporting St. Barthelemy or “the West Indies” as their place of birth. Of the Caribbean born living in the United States in 2000, just under two-thirds arrived after 1980. The Dominican Republic, Cuba, Jamaica, and Haiti accounted for the largest number of arrivals between 1990 and 2000. The Caribbean-born groups with the largest percentage of recent migrants were from Guadeloupe, Dominica, the Dominican Republic, and the Bahamas. In fiscal year (FY) 2005, 108,469 Caribbean-born persons became lawful permanent residents (LPRs) of the United States. In FY 2005, 30,370 Caribbean-born persons entered the United States on nonimmigrant visas, most on temporary worker or student visas. Florida, New York, New Jersey, Massachusetts, and California were the top five states in which the Caribbean born resided in 2000. The Caribbean born composed at least 15 percent of the foreign-born populations of Florida, New York, Rhode Island, and New Jersey. The Caribbean born were more likely to be citizens than the foreign-born population in general. The Caribbean born were slightly older than the overall foreign-born population. Two-thirds of the Caribbean born spoke a language other than English at home. Just under two-thirds of the Caribbean born who spoke a language other than English at home spoke English less than "very well." Over 60 percent of the Caribbean born had a high school or higher degree. Under one-sixth of the Caribbean born had a college education. The Caribbean born were as likely to participate in the labor force as the overall foreign-born population. The Caribbean born were more likely to be unemployed than the foreign born in general. The Caribbean born were concentrated in sales or office and service occupations. Caribbean men from Aruba, the Netherlands Antilles, and Anguilla had the highest median earnings. Caribbean women from Anguilla, the British Virgin Islands, and the Netherlands Antilles had the highest median earnings. About one-fifth of Caribbean-born individuals lived in poverty. About 46 percent of Caribbean-born householders owned their own home. In 2000, of the 31.1 million foreign born in the United States, about 2,953,066 (9.5 percent) were born in Caribbean countries. Cubans (872,715) accounted for 29.6 percent of the overall Caribbean-born population in 2000. The other main countries of birth were the Dominican Republic (687,675), Jamaica (553,825), Haiti (419,315), and Trinidad and Tobago (197,400) (see Figure 1). For information on where specific groups are living, see State Immigration Data Profiles. Note: Other Caribbean countries includes those reporting their birthplace as Dominica, St. Lucia, St. Kitts-Nevis, Montserrat, Aruba, the Netherlands Antilles, the Cayman Islands, the British Virgin Islands, Guadeloupe, Turks and Caicos Islands, Martinique, Anguilla, the West Indies, and St. Barthelemy. About 53.8 percent of the Caribbean born were women, compared with 50.2 percent of the foreign-born population in general. Only the Netherlands Antilles had more male immigrants than female, though the difference was very slight (50.3 percent male). The countries with the least-balanced gender ratios were the Cayman Islands (63.7 percent female), the British Virgin Islands (63.2 percent female), Montserrat (59.4 percent female), and Turks and Caicos Islands (59.4 percent female). Between 1990 and 2000, the number of Caribbean-born individuals living in the United States increased from 1,938,348 to about 3.0 million, an increase of 1,014,718 (52.3 percent). This was a slightly lower rate of growth than the foreign-born population in general, which grew 57.4 percent. The bulk of the increase after 1960 is a result of growing numbers from Cuba, the Dominican Republic, Jamaica, and Haiti. The foreign-born population from Cuba grew by 793,566 over this period, the Dominican Republic by 675,794, Jamaica by 529,068, and Haiti by 414,501 (see Figure 2). Note: 1960 and 1970 data not available for Barbados, and 1960 data not available for Trinidad & Tobago. Source: U.S. Census Bureau, Census 2000; Gibson, Campbell and Emily Lennon, U.S. Census Bureau, Working Paper No. 29, "Historical Census Statistics on the Foreign-Born Population in the United States: 1850 to 1990." Between 1990 and 2000, 33.9 percent of the total Caribbean born arrived in the United States, 29.7 percent arrived between 1980 and 1989, and 36.5 percent arrived before 1980. 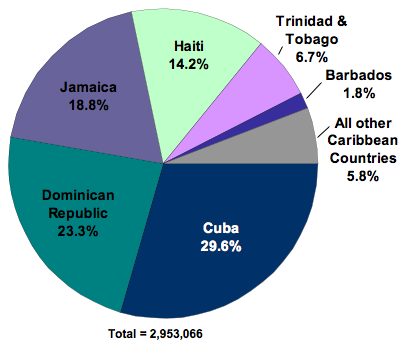 The Caribbean-born groups with the largest numbers who entered between 1990 and 2000 were from the Dominican Republic (297,235), Cuba (229,140), Jamaica (174,360), and Haiti (164,180). The Caribbean-born groups with the largest percentage of their own U.S. populations arriving between 1990 and 2000 were from Guadeloupe (51.9 percent), Dominica (44.3 percent), the Dominican Republic (43.2 percent), and the Bahamas (40.5 percent), together accounting for 316,555 new arrivals. The Caribbean born made up 9.7 percent of all new LPRs in FY 2005. The largest portion (38,481 or 35.5 percent) of Caribbean-born LPRs were immediate family members of U.S. citizens; 33,727 (31.1 percent) were refugees or asylees adjusting to permanent status; 29,379 (27.1 percent) had family sponsorship; and only 3,229 (3.0 percent) were employer-sponsored. The countries with the highest number of new LPRs in FY 2005 were Cuba (36,261), the Dominican Republic (27,504), and Jamaica (18,346). Ninety percent (32,555) of the new LPRs from Cuba were refugees or asylees, while 7.7 percent (1,118) of new LPRs from Haiti were asylees or refugees. Together these countries accounted for 99.8 percent of Caribbean-born refugees/asylees gaining LPR status in FY 2005. Of the 30,370 nonimmigrant visas issued to Caribbean-born persons in FY 2005 (excluding those visiting for business or pleasure), 11,435 (37.7 percent) were H visas for temporary workers and trainees; 6,092 (21.1 percent) were F visas for students; 3,315 (10.9 percent) were J visas for exchange visitors; and 2,819 (9.3 percent) were K visas for fiancés of U.S. citizens. Nearly half (45.8 percent or 13,919) of nonimmigrant visas issued to the Caribbean born went to persons born in Jamaica, while 23.2 percent (7,047) went to persons born in the Dominican Republic and 9.4 percent (2,855) went to persons born in Trinidad and Tobago. The largest portion of visas issued to Jamaicans (66.1 percent or 9,206) were H visas for temporary workers and trainees and 12.6 percent (1,758) were F visas for students. Of visas issued to persons born in the Dominican Republic, 23.4 percent (1,651) were J visas for exchange visitors and 17.1 percent (1,207) were H visas for temporary workers. Over four-fifths (83.4 percent) of the Caribbean born lived in five states in 2000. Florida was home to 1,105,079 (36.4 percent), New York to 1,004,344 (33.1 percent), New Jersey to 238,572 (7.9 percent), Massachusetts to 112,116 (3.7 percent), and California to 70,135 (2.3 percent). While the Caribbean born made up 9.5 percent of the total foreign-born population in 2000, they represented 41.4 percent of the 2.7 million foreign born in Florida, 26.0 percent of the 3.9 million foreign born in New York, 16.5 percent of the 119,277 foreign born in Rhode Island, and 16.2 percent of the 238,572 foreign born in New Jersey. Just under half (1,459,585) or 49.7 percent of the Caribbean born were naturalized U.S. citizens, compared with about 40 percent (12.5 million) of the total foreign-born population. The Caribbean countries whose nationals were most likely to be naturalized were Anguilla (69.1 percent), the British Virgin Islands (61.7 percent), Barbados (61.0 percent), and Cuba (60.6 percent). Substantial portions of the foreign born from each of these countries had entered the United States before 1980. Conversely, the sending countries with the lowest naturalization rates — Guadeloupe (36.2 percent), the Dominican Republic (36.4 percent), the Bahamas (37.4 percent), and the Netherlands Antilles (41.4 percent) — tended to be those with high proportions entering between 1990 and 2000. The median age of the Caribbean born (41.0 years) reflected a slightly older population than the overall foreign-born population (37.5 years) in 2000. The oldest Caribbean-born groups were from Martinique (with a median age of 52.8 years), Cuba (49.8 years), Montserrat (47.6 years), and Aruba (47.2 years). The youngest Caribbean-born groups were from Guadeloupe (30.3 years), the Bahamas (30.6 years), and Dominica (35.4 years). However, the countries with older median ages represented populations that had been in the United States the longest, suggesting that the immigrants aged while in the United States and were not necessarily older at the time of immigration. Conversely, the countries with lowest median ages were also countries with the highest proportions entering between 1990 and 2000. About 1.9 million (66.5 percent) of the Caribbean born age 5 and older spoke a language other than English at home, compared with about 83 percent of the overall foreign-born population. The groups with the highest percentage of those speaking a language other than English at home were from the Spanish-speaking Dominican Republic (94.2 percent) and Cuba (93.9 percent), and from French- and Creole-speaking Haiti (93.9 percent) and Martinique (84.9 percent). Of the Caribbean born age 5 and older who spoke a language other than English at home, about 37.4 percent reported speaking English "very well" compared with 38.5 percent of the overall foreign-born population. The Caribbean born from the British Virgin Islands (85.7 percent), St. Lucia (83.0 percent), and the Bahamas (81.7 percent), where English is the official language, had the highest degree of English proficiency, followed by English-speaking Anguilla (77.4 percent) and St. Kitts-Nevis (75.7 percent). Conversely, the Caribbean-born groups least likely to speak English "very well" were from the Dominican Republic (29.9 percent), Cuba (35.8 percent), and Haiti (44.5 percent). Of the Caribbean-born population age 25 and older, 61.5 percent reported having a high school or higher degree compared with 61.8 percent of the total foreign-born population. Those born in the Netherlands Antilles (87.0 percent), Aruba (86.0 percent), and Martinique (82.1 percent) were the most likely to report having a high school degree or higher. Those born in the Dominican Republic (47.8 percent), Cuba (58.7 percent), and Haiti (61.7 percent) were the least likely to report having completed a high school education. Of the Caribbean-born population age 25 and older, 15.7 percent had a bachelor's degree or higher level of education, compared to 24 percent of the overall foreign-born population. Those born in the Netherlands Antilles (39.6 percent), Aruba (34.1 percent), and Anguilla (29.5 percent) were the most likely to report having a bachelor's or higher degree. Those born in Turks and Caicos Islands (8.4 percent) were least likely to report having a bachelor's or higher degree, followed by those born in the Dominican Republic (9.4 percent) and the Cayman Islands (10.0 percent). Among the population age 16 and older, 60.6 percent (1.7 million) of the Caribbean born participated in the civilian labor force, compared with 60.5 percent (17.3 million) of the total foreign born. Caribbean-born groups who were most likely be in the labor force were from Anguilla (72.5 percent), St. Kitts-Nevis (71.7 percent), and Jamaica (70.9 percent). The Caribbean born who had the lowest labor force participation rates were from the Cayman Islands (45.8 percent), Cuba (52.3 percent), and Guadeloupe (54.9 percent). Of the population age 16 and older in the civilian labor force in 2000, 8.8 percent of the Caribbean born reported they were unemployed, compared with 6.8 percent of the overall foreign-born population. The Caribbean-born groups most likely to be unemployed were from the Dominican Republic (12.6 percent), Anguilla (11.4 percent), and the Bahamas (10.8 percent). The Caribbean-born groups least likely to be unemployed were from Montserrat (4.7 percent), Aruba (5.1 percent), and Martinique (5.6 percent). Of the employed population age 16 and older in the civilian labor force, the Caribbean born were more likely to work in sales and office as well as service occupations than the overall foreign-born population. Conversely, the Caribbean born were less likely to work in management or professional; farming, fishing, and forestry; construction; or production, transportation, and material moving occupations than the foreign born in general (see Table 1). Source: U.S. Census Bureau, Census 2000, Foreign-Born Profiles, STP-159. Among full-time, year-round workers in 1999, the median earnings for Caribbean-born men were slightly lower than for foreign-born men in general, with Caribbean-born men earning $29,000 and foreign-born men in general earning about $30,000. The Caribbean-born men with highest median earnings were from Aruba ($50,019), the Netherlands Antilles ($45,058), and Anguilla ($37,083). Those with the lowest median earnings were from the Dominican Republic ($24,439), Haiti ($25,835), and the Bahamas ($29,844). The Dominican Republic and Haiti were also among groups with relatively low English-language ability and educational levels. However, high shares of the foreign born from the Bahamas spoke English "very well" and had a high school degree or higher level of education. Among full-time, year-round workers in 1999, the median earnings for Caribbean-born women ($25,000) were the same as those for all foreign-born women ($25,000). The Caribbean-born women with highest median earnings were from Anguilla ($41,538), the British Virgin Islands ($35,096), and the Netherlands Antilles ($31,818). Those with the lowest median earnings were from the Dominican Republic ($19,547), Haiti ($22,267), and Martinique ($23,681). Of the people for whom poverty status was determined in 1999, Caribbean-born individuals (19.2 percent) were more likely to live in poverty than the foreign born overall (17.9 percent). The Caribbean-born groups with the lowest poverty rates were from Martinique (10.0 percent), Aruba (11.7 percent), and Barbados (12.1 percent). The Caribbean-born groups with the highest poverty rates were from Turks and Caicos Islands (34.6 percent), the Dominican Republic (26.5 percent), and the Bahamas (23.8 percent). In 2000, 45.7 percent of Caribbean-born householders owned their homes, compared with 49.8 percent of all foreign-born householders. The Caribbean-born householders most likely to own their homes were from the Cayman Islands (63.3 percent), Aruba (60.1 percent), and Cuba (58.2 percent). The Caribbean-born householders least likely to own their homes were from the Dominican Republic (20.0 percent), St. Lucia (37.6 percent), and Guadeloupe (37.7 percent). Some descriptions of the characteristics of the Caribbean born do not include those reporting St. Barthelemy or "the West Indies" as their place of birth. Although the number of visas issued in a year provides a good proxy for the number of people entering the country on a particular visa in a given year, the two numbers are not exactly the same; that is, not all visas issued are necessarily used, or used in the same year in which they were issued. For information on sampling error, nonsampling error, and definitions (labor force, occupations, and poverty), click here. Gibson, Campbell and Emily Lennon (1999). "Working Paper No. 29: Historical Census Statistics on the Foreign-Born Population of the United States: 1850 to 1990." Washington, DC: U.S. Government Printing Office. Ruggles, Steven, Matthew Sobek, Trent Alexander, Catherine A. Fitch, Ronald Goeken, Patricia Kelly Hall, Miriam King, and Chad Ronnander. 2004. Integrated Public Use Microdata Series: Version 3.0. Minneapolis, MN: Minnesota Population Center. U.S. Census Bureau, Census 2000. U.S. Department of Homeland Security, Office of Immigration Statistics, Yearbook of Immigration Statistics, 2005. U.S. Department of State, Report of the Visa Office, 2005. David Dixon was previously an Associate Policy Analyst at MPI, where he worked on immigrant integration, impacts of highly skilled immigrants, and the well-being of the children of immigrants.